"The one who writes the history is oftentimes the one who receives the glory. This is especially true in military history. Those who survive the battle are able to tell their story known to the public. In some cases, those who die in battle can either be relegated to obscurity or their achievements are underrated because there is no one to tell their story. The Colonel of the 140th New York at the Battle of Gettysburg was one whose story is relatively unknown. Although the armies would leave the town of Gettysburg, those three days in July remain. Today the entire town and surrounding area of Gettysburg focus on the battle. Bookstores and tourist shops are filled with books, souvenirs, and pictures. A very common picture is the downhill charge of Colonel Joshua Chamberlain of the 20th Maine. The town's most popular sites on the battlefield are Little Round Top and Picket's charge. Colonel Chamberlain is credited as the hero of the battle for Little Round Top and for saving the Union Army. 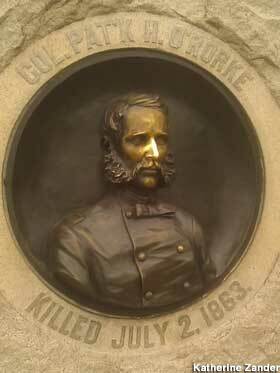 On the western slope of Little Round, overshadowed by a huge monument to New York is a small monument with a relief sculpture of Colonel Patrick O'Rorke of the 140th New York….."
I almost gave up reading it when he stated the 20th Maine was on both ends of Vincent's line. He did get it right shortly after that stating the 16th Michigan was on the right. If I were to try and make a claim for O'Rorke's bravery based on this article I would be hard pressed. It is a confused and poorly written narrative…. I agree bad article, but if you go through the timeline of events it does makes some scents.